For this performance I called upon the archetype of The Scapegoat & The Shepherd in an effort to have us imagine a deliberate manipulation of individuals by skillful strategists who understand the mechanisms of victimization and who knowingly sacrifice innocent victims with ease and for their own gain. 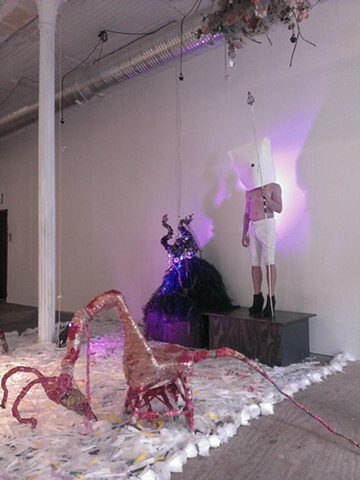 Guests entered the gallery looking up to a large horned white creature hanging from the ceiling while tripping over a long wiry pink tail that took up most of the lobby floor, the tail led to a shiny pink scapegoat chair structure with a long flowery neck tied down to the floor covered in mesh netting bits. In order to enter the rest of the gallery viewers had to pass through my installation (in this way doubling as a border). On the floor I wrote imploring the viewer to "enter me softly". The installation was populated by 2 scapegoat thrones, 3 scapegoat idols and 2 performers including myself (Scapegoat) and movement artist Alexander D'Agostino (The Shepherd). The two of us enjoyed the vista against a white wall and I was pleasantly surprised by how many people naturally felt compelled to touch the Scapegoat Idols throughout the performance. The "thrones" in the installation were performed/created in my living room using the wrapping technique of 'Visionary'/'Outsider'/'Untrained' Artist Judith Scott. I began with a pre-existing contemporary chair frame and carefully wrapped silk flowers, bones and other recycled materials until my desired forms were reached before sealing them with resin.